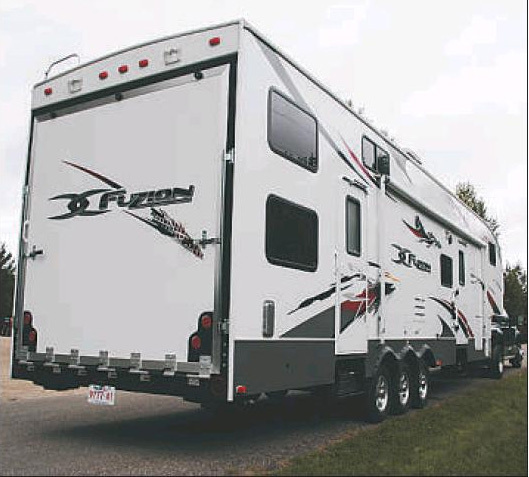 The Keystone Fuzion toy hauler fifth- wheel trailer is a fun, functional and attractive hauling machine. The bedroom area has a full- sized queen bed with a pillow- top mattress. RVing has always gone hand- in- hand with snowmobiling and off- roading. Having the ability to search out new destinations is a welcome option for those looking for more variety in their terrain while still remaining comfortable. Toy haulers have been around for years, but they are gaining ground on their garage- less brethren. 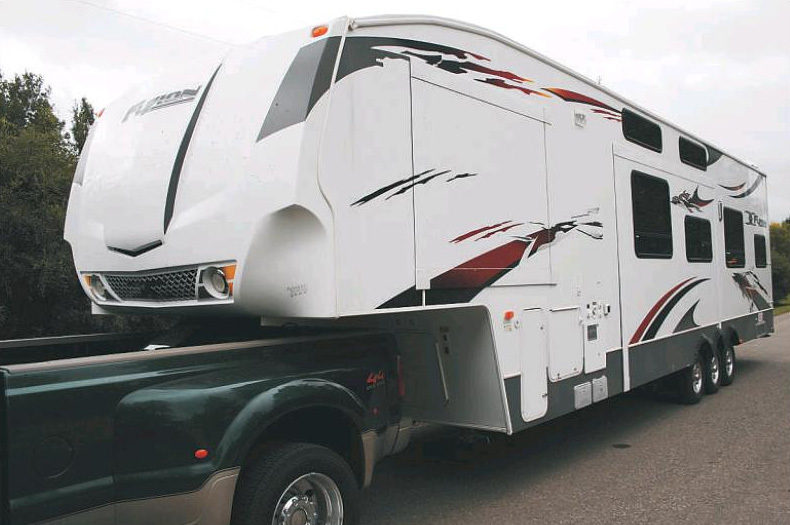 Normally, there has to be some compromise in order to make a useful garage in a fifth- wheel unit, and the Keystone Fuzion toy hauler is no exception, but Keystone has managed to skirt many of the typical compromises and create a fun, functional and attractive hauling machine. 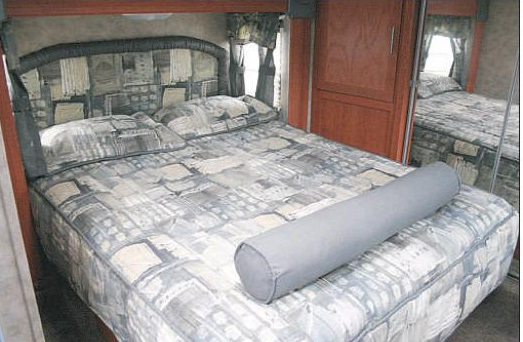 Our test model, the Fuzion 362 came with two large slides; one moving the entire centre section out to the driver’s side, while the second expands the bedroom, sliding out the queensized bed, again, out the driver’s side. The two higher models, the 373 and 393 offer a third slide on the passenger side that creates more room in the kitchen area and allows Keystone to include a peninsula countertop that doubles counter space, while offering a place to pull up bar stools. The other major addition in the 393 model is a 14- foot garage, two- feet longer than both the 362 and 373 models. While the 12- foot garages can easily accommodate a pair of snowmobiles or ATVs along with plenty of tools, luggage and camping gear, if so inclined the 14- foot garage could actually swallow a small car. A very nice plus for those taking long road trips, or even weekend race- car drivers looking for an affordable travel solution instead of buying a full size rig. The garage comes set up and ready to roll with the only thing you need to add being machines and fuel. The standard package includes full stainless steel checker- plate flooring, overhead cabinets, cleaning station, exhaust vents, a rear wall screen enclosure, 1,200– lb. recessed d- rings for tying down your machines and a 110L fuel station with a 12- volt pump so there’s no fumbling with gerry cans in the trailer. One of the big compromises with toy haulers has been no access to the garage from inside. The Fuzion offers sliding patio d o o r s t h at wi l l s e a l i n a ny unwanted smells from the garage, but allows quick access without having to go around and enter through the side door. While the garage itself is tough and rugged, the trailer side is comfortable and accommodating. Above the hitch is the bedroom with a full- sized queen bed featuring a pillow- top mattress thanks to the generous slide. The washroom and shower are both comfortable and spacious, with the nice addition of a skylight above the shower for extra light. Full- length mirrors at the front of the trailer slide open to reveal a large closet next to a dresser large enough to hold clothes for several weeks without a wash.
Down the steps into the living area and right at the entrance to the trailer you will find the brain of the trailer. The control panel houses all of the switches and controls to get this Fuzion into action, including the slides, outdoor security lights, generator controls, fuel gauge and levels as well as the Fuzion’s surprising audio and video system. A DVD player hooked into the 26- inch LCD display sits just above the Pioneer CD/ MP3 deck that feeds four interior or two exterior speakers, as well as a 12- inch powered Rockford Fosgate subwoofer placed proudly on display in the bottom of the panel. One potential issue is that the subwoofer did not have any sort of protective grille covering the speaker. Being right at the hightraffic area of the entrance it’s likely only a matter of time until the expensive speaker is damaged by an errant foot or piece of camping equipment coming in or out of the trailer. Solid wood cabinetry with secure locking mechanisms runs throughout the Fuzion, most notably in the fully- loaded kitchen. 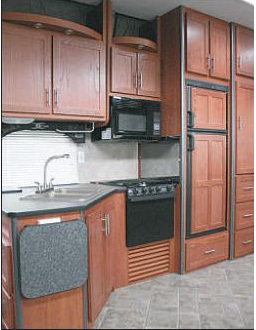 A three- burner stove, 22inch oven, microwave and large refrigerator are surrounded by storage. While the two higher models come with the aforementioned peninsula, the 362 is no slouch in the counter- space department either, with plenty of space for two people to move about. Sleeping accommodations appear all over the Fuzion. A step ladder takes you up to a twin bed above the entrance to the garage. Twin bunk beds drop down from the ceiling inside the garage at the flip of a switch. A full- size couch and loveseat sit side by side facing the kitchen and the couch includes a hide- abed as well. There’s enough space for six people, or up to 10 if folks double up in the twins. Outside the Fuzion continues the attractive treatments with a smoothed nose to help airflow and graphic elements across the entire body leading to six stylish aluminum wheels. Power leveling legs drop from the front end to lift the weight off the fifthwheel hitch when unhooking on site while a pair of floodlights help light the front end when working at night. Keystone has managed to provide many of the wants when it comes to building a toy hauler without neglecting the needs for a successful RV. The compromises for adding the garage space are noticeable, but living space inside the trailer is still quite comfortable for a smaller group. Try to buy a home that meets most of your needs for the next five to ten years or find one that can grow and change. The environment surrounding your home can be almost as important as the environment inside of it. – Size requirements. Do you need several bedrooms, more than one bathroom, space for a home office, a two-car garage? – Special features. Do you want air conditioning, storage or hobby space, a fireplace, a swimming pool? Do you have family members with special needs? – Lifestyles and stages. Do you plan to have children? Do you have teenagers who will be moving away soon? Are you close to retirement? Try to buy a home that meets most of your needs for the next five to 10 years, or find a home that can grow and change with your needs. Use the Home Features Checklist at www.cmhc.ca to see what you want, need and may potentially need in the future. Use CMHCs Home Hunting Comparison Worksheet to note and compare features of up to three different homes to help you decide on the right home for you. – Personalized choices. You may be able to upgrade or choose certain items such as siding, flooring, cabinets, plumbing and electrical fixtures. – Up-to-date with the latest codes/standards. The latest building codes, electrical and energy-efficiency standards will be applied. – Maintenance costs. Lower maintenance costs because everything is new and many items are covered by a warranty. – Builder warranty. 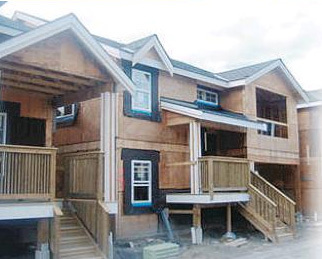 A homebuilder’s warranty is usually available in all provinces (except Nunavut and the Northwest Territories). This can be important if a major system such as plumbing or heating breaks down. This warranty does not apply if you build the home yourself. – Neighbourhood amenities like schools, shopping malls and other services may not be complete for years. – Taxes such as the Goods and Services Tax (GST) (or, in certain provinces, the Harmonized Sales Tax (HST)) will apply. However, you may qualify for a rebate of part of the GST or HST on homes that cost less than $450,000. For more information about the GST New Housing Rebate program, visit the Canada Revenue Agency website at www.cra-arc.gc.ca. – Extra costs. You may have to pay extra if you want to add a fireplace, plant trees and sod, or pave your driveway. Make sure you know exactly what’s included in the price of your home. – Easy access to services. Probably established in a neighbourhood with schools, shopping malls and other services. – Landscaping is usually done and fencing installed. Previously owned homes may have extras like fireplaces or finished basements or swimming pools. – No GST/HST. You don’t have to pay the GST/HST unless the house has been renovated substantially, and then the taxes are applied as if it were a new house. – Possible redecorating and renovations. You may need to redecorate, renovate or do major repairs such as replacing the roof, windows and doors. Posted in Real Estate Related | Comments Off on What Should You Buy? It’s dressed down on the outside and you could sail past it without a blip on the radar. But Suvai gets more interesting inside with a warm, intimate bistro feel. Note the chocolate walls (dark, that is, not milk), spare but twinkly chandeliers, ’40s retro music and regulars, a grateful bunch who make a point of telling the chef how much they enjoyed the meal. 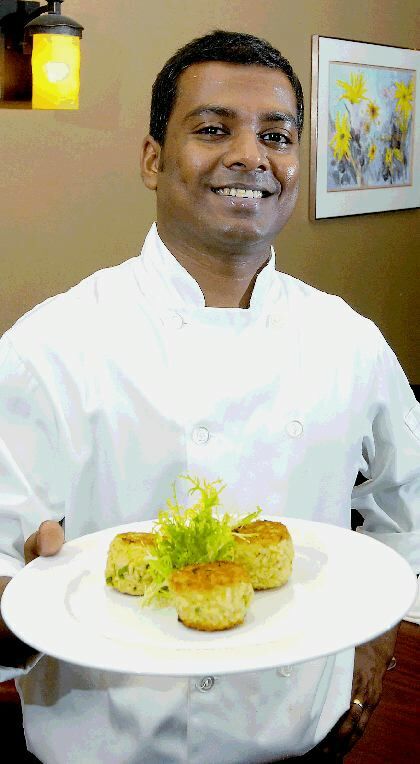 The man behind the stove at Suvai (means taste in Tamil) is Segar Kulasegarampillai, who started in the restaurant trade at the bottom rung in Toronto. Along the way, he’s done a stage at Ontario’s culinary zenith, Michael Stadtlander’s Eigensinn Farm. Before moving to Vancouver in 2005, he was the chef at Mildred Pierce, a Toronto restaurant that’s been doing things right for 17 years. (It recently closed but it’s reopening at another location.) Kulasegarampillai also taught at Cookworks, the adjoining cooking school. At Suvai, his food is straightforward and for it to be worthy of revisits, it’s got to be delicious and succulent, not boring. He delivers with most but not all the dishes on his streamlined menu. Some need more depth to be knock-outs but the thing is, this is a good-value restaurant so you cannot complain that you’re not getting exquisite returns. Starters are $7 to $11 and mains are $14 to $29. The best dish I had — the star anise ginger-braised beef shortribs with scallion mash and sautéed spinach — was $19. If you eat meat, I insist you order it. To start, try the crab and shrimp cakes with chipotle aioli, with an abundance of crustaceans. A maple-roasted butternut squash soup with duck confit had a silky, luscious texture but was strangely, not flavourful; Fanny Bay oysters with black tiger prawn dish might be better received without those imported prawns — I’d prefer a greedy assault on local in-season oysters. The pan-seared scallops were great — it still had the wobbles, which meant it wasn’t overcooked. It was served with lentils with bacon, swiss chard and a lovely sauce tasting of truffle. Grilled salmon didn’t hit the bulls eye; it was cooked longer than I like and had turned a little tough; the black Thai rice and coconut ginger broth held their own on the plate though. Roast rack of Australian lamb was perfectly cooked and came with roasted garlic mash, ratatouille and rosemary jus. Desserts are comfort dishes — a bread pudding was better than most, not too dense and heavy as it often is; creme brulée was more of a home-style version, not velvety smooth. The wine list features some good-value choices for a neighbourhood restaurant. The Almansa Reserva Piqueras Castillo de Almansa and Cotes du Roussillon Chateau du Parc were delicious by-the-glass choices. Servers are older, experienced guys, appropriate for Kerrisdale market and refreshing, really. On one visit however, the quiet ambiance was rudely interrupted by the arrival of the dishwasher, who works in the open kitchen. He banged, crashed, clanged and rattled like he might be capturing an elephant back there. The boss didn’t seem to notice. The federal government on Wednesday set aside a block of wireless-telephone space for a possible fourth national carrier to get into the market and bring more competition to cellphone rates. Industry Canada has set aside 40 megahertz of the 105 megahertz of new wireless airwaves that it plans to auction off on May 27 for companies with less than 10 per cent of the national wireless market. “The Canadian wireless market is dominated by three companies that provide services across the country and control 95 per cent of the market,” Industry Minister Jim Prentice told reporters Wednesday in Toronto. As well, the incumbent carriers — Bell Canada, Rogers Communications Inc., and Telus Corp. –must allow any new entrants that purchase enough spectrum to qualify as a national player to use their networks of cellular towers for roaming. The spectrum auction details will undoubtedly widen the chasm between the three national telecom firms and smaller regional players that have pressured the government to make it easier for them to enter the mobile market. “We’re deeply disappointed,” said Michael Hennessy, vice-president of wireless, broadband and content policy at Telus Corp. He said favouring new entrants will simply allow smaller, less financially viable competitors into the market, and they won’t be able to compete. Hennessy said blocking the companies most able to pay for the new airwaves, known as spectrum, will mean that Ottawa receives less revenue for the airwaves. He estimated the auction would raise an additional $200 million if it wasn’t restricted. That amount, he said, amounts to a subsidy to the new firms. He added that likely new entrants to the market, such as printing giant Quebecor Inc. and Western cable firm Shaw Communications Inc. shouldn’t need help entering the market. 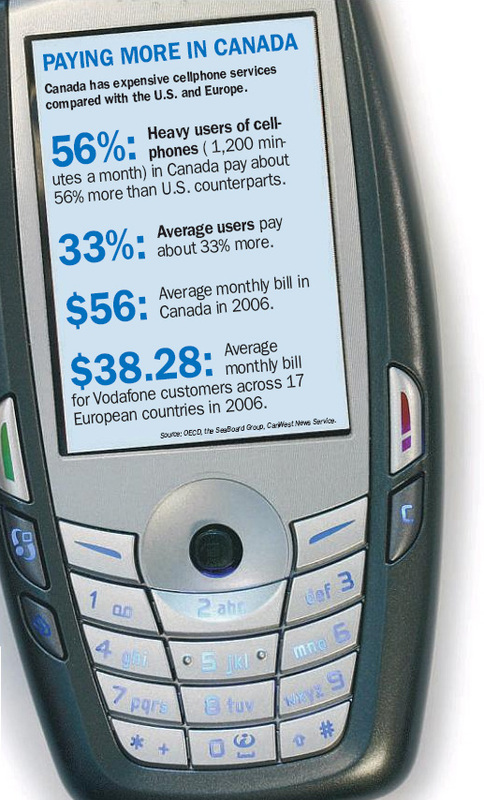 Canada has been criticized as having some of the highest cell-phone rates in the world. However, Hennessy countered that Industry Canada is using “selective information” to back its policy decision while ignoring other studies that show Canada has lower prices than countries such as the United Kingdom, France and Japan when it comes to voice services. Hennessy said Canadians who are big users of wireless data service do pay higher prices than similar users in the U.S., but prices are coming down. He said Canada needs a bigger-scale market if it is to dramatically reduce phone rates, either by allowing consolidation or allowing more foreign ownership. “The idea, and Industry Canada seems to have a love affair with this idea, that you can create smaller companies in the Canadian market and somehow expect the Canadian market to be more globally competitive, I think, is naive, and in the long run, dangerous,” Hennessy said. Bell Canada executive vice-president Lawson Hunter said he was “surprised and disappointed” with the announcement. “It is one of the most regulatory and intrusive spectrum auctions in Canada,” Hunter said, adding the amount of spectrum set aside for new players will not be enough for bandwidth-intensive services to function effectively for consumers if they are on a smaller regional player. SeaBoard Group managing director Iain Grant, whose report on high wireless prices in Canada was cited by the ministry, dismissed Hunter’s idea that there would not be enough spectrum allocated for all players to cram all their bandwidth-rich programs into. “Mr. Prentice has done a heroic job of plowing through impartial truths to get to the heart of the matter,” said Grant. However, telecommunications consultant Eamon Hoey, with the firm Hoey Associates, who was a proponent of allowing the restricted auction, said Prentice’s decision didn’t go far enough and puts up barriers against possible new entrants. Hoey said the entire block of new spectrum should have been set aside for new entrants, and Industry Canada should have set terms for new firms to access the incumbents’ cellular towers while building their own networks. Instead, Prentice said it will be up to incumbent companies and new firms to negotiate fair rates for tower access and roaming fees, with an arbitration process to handle disputes. “[Disputes] will go to arbitration, and it will be a long zoo,” Hoey said. “What Industry Canada has done is advanced [potential competition] one yard on a 110-yard field,” Hoey said. Quebecor, Shaw, and Manitoba Telecom Services have all been named as potential new entrants. Quebecor has said openly it wants to build a network in the province of Quebec. Shaw, meanwhile, said in late October it has no current plans to enter wireless. MTS said earlier this month that, while it sees value in creating a fourth national wireless company, it will not decide whether to go ahead until it sees the auction rules. The highlighted portion of the seawall along False Creek will reopen next week. While the partial closure of First Avenue to motorists Dec. 3 is bad news for drivers, it’s great news for pedestrians and cyclists who will travel uninterrupted along the seawall for the first time in 18 months. Pedestrians and cyclists will cruise along on separated paths that can carry them all the way around Stanley Park and over to Kits and Jericho beach to UBC and the Endowment Lands. The city has completely rehabilitated the shoreline east of Cambie Bridge to Science World. “The old shoreline was in really rough shape. It was a lot of concrete and asphalt and rebar,” Andrews said. Decks with viewing abutments have also been added to this area. The centre of the refurbished area is more urban with massive granite steps leading into the sea. A new pedestrian bridge will be brought in by water at high tide and set in place over an inlet roughly between Columbia and Manitoba before the end of the year. Closer to Cambie Bridge, a new intertidal channel and island have been built to reintroduce a marine habitat. The island is shaped like an iceberg with a small top and a large base to provide ample intertidal space between low and high tide. “False Creek used to be almost all intertidal marsh. At low tide, it was all muck and sands and grasses that were exposed and at high tide, it looked like just another part of the ocean,” Andrews said. Sometime after Dec. 3, the public will be able to reach the island via a spit of cobblestones. “That small thin connection will flood at high tides… It was designed in a way that it doesn’t flood very often, but it does once in a while so it is a bit of a sense of adventure and discovery to go out there,” Andrews said. At low, low tide, the island will appear connected to the mainland. The city is working on a weir bridge where the wetlands it’s developing to harvest and treat rainwater will flow out, so pedestrians may not be able to access the island right away. The city may also wait until all of the native vegetation including evergreens, Oregon grape and salal shrubs have taken root to open the island to the public. Dead trees were also planted to provide perches for birds to nest. “A lot of the [flora] we don’t see at all in False Creek and so it is kind of interesting to go down that list and see what we are reintroducing here that used to be here naturally a hundred or plus years ago,” Andrews said. The section of the seawall between Science World and Cambie Bridge is about 90 per cent complete. Final finishing and landscaping will be done once the grading of the adjacent construction concludes in 2008. Andrews expects a grand reopening of the seawall in February. Riverbend (phase three) Estimated development cost: Unknown (but extrapolated from original selling prices and number of units, at least $13million) Units: 42, Where: Riverbend Drive, Coquitlam. 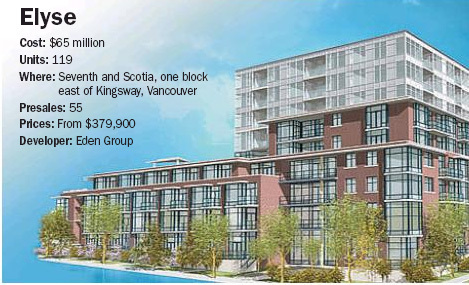 Presale: 32 Prices: $330,000 to $380,000, Developer: CB Development (2000) Ltd.
Vancouver-based Eden Group has cancelled two city condominium projects, citing rising construction costs that would have created huge losses if they were to proceed. “We’re not in a financial position to proceed for a variety of reasons,” company owner Bill Eden said in an interview. The projects include the $65-million, 119-unit Elyse at East 7th Avenue and Scotia Street and the $30-million, 31-unit Montgomery Estates townhouse project at Oak Street and 43rd Avenue. Fifty-five buyers made pre-sale purchases of Elyse units earlier this year, and their deposits will be refunded. No pre-sales were conducted on the Montgomery Estates development. Eden plans to sell off both sites. He noted that most of the pre-sale buyers in the Elyse development were investors in the project itself, who had the right to pre-purchase units. “They’re not public third-party people,” Eden said. He said the civic workers strike caused costly delays this year, and rising labour and materials expenses made construction costs prohibitive. He said he wanted to save investors’ money and prevent “purchasers’ anguish” by shelving the projects now. Greater Vancouver Home Builders Association chief executive Peter Simpson said Eden probably did the right thing under the circumstances. “He looked down the road and saw endless problems with these projects. So he wanted to terminate them now, sooner than later, out of respect to his customers,” he said in an interview. The project cancellations follow similar recent developments in Metro Vancouver — including the controversial cancellation of 32 pre-sale contracts on the Riverbend project in Coquitlam after the developer claimed rising costs had raced ahead of pre-sale prices. He said Eden‘s costs mounted this year following delays caused by the civic workers strike, but the strike did not cause the projects’ demise. “The problem was rising costs and the onerous development process in Vancouver,” Simpson said. “Builders obviously need to plan for all this stuff, but sometimes you have the best-laid plans and they just don’t work out. The B.C. 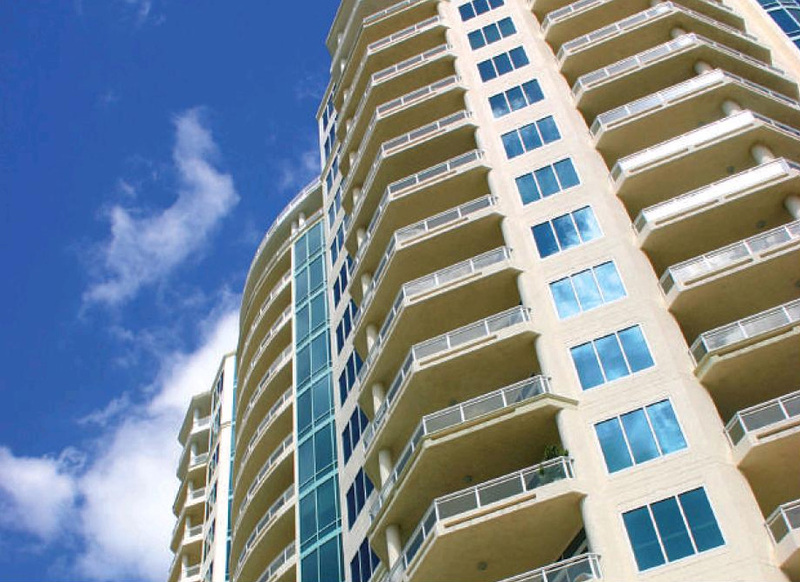 Financial Institutions Commission recently ordered developers to provide increased disclosure to buyers of pre-sale condominiums which have yet to be built. The disclosure rules, which took effect Nov. 1, force developers to explain any provisions for terminating, extending or assigning purchase agreements. Buyers are required to initial the cover page of disclosure statements to confirm the provisions were drawn to their attention. Pertinent information must also appear in “conspicuous type” on the statement’s cover page. – Their experience in the development industry. – Whether they have been bankrupt in the past five years or been disciplined in the past 10 years for matters relating to real estate, mortgages of land, securities, theft or fraud. – Whether any conflict of interest exists that could affect a buyer’s purchase decision. Failure to comply with the disclosure requirements could result in the issuance of cease-marketing orders or “administrative penalties” of up to $50,000. 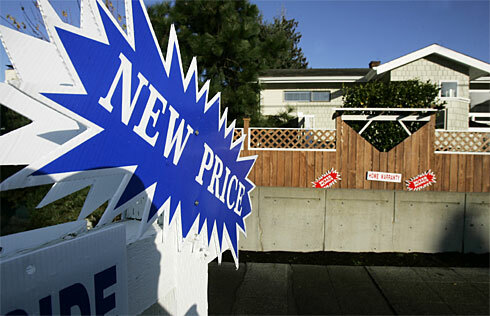 A sign advertises a price change this week on a West Seattle home. Home prices nationally plunged 4.5% in the third quarter from a year earlier. 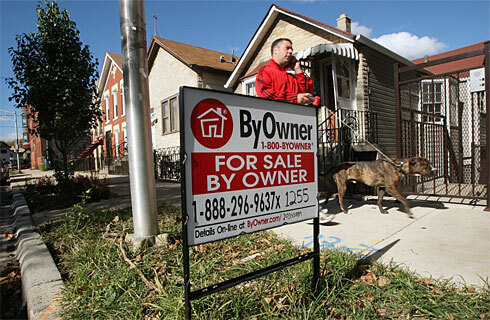 NEW YORK (AP) — Home prices fell 4.5% in the third quarter from a year earlier, the sharpest drop since Standard & Poor’s began its nationwide housing index in 1987 and another sign that the housing slump is far from over, the research group said Tuesday. One of the index’s creators also predicted that there’s a significant chance of a recession as the economy contends with falling housing prices, spiking foreclosures and turmoil in the financial markets. “Over 50%,” said MacroMarkets chief economist Robert Shiller, giving his odds for a recession. Other economists have put the chance of recession at one in three. The S&P/Case-Shiller quarterly index tracks prices of existing single-family homes across the nation compared with a year earlier. The index also showed that prices fell 1.7% from the previous three-month period, the largest quarter-to-quarter decline in the index’s history. After 13 years of rising home values — with the greatest increases occurring in the first part of this decade — the housing market has started to unravel, spreading from Main Street to Wall Street. Declines in housing prices have kept homeowners, especially those with riskier mortgages and spotty credit, from refinancing, sending them into default and foreclosure at a quickening pace. More foreclosed properties have added to an already ballooning inventory of homes on the market, further depressing values. Investors holding securities backed by mortgages have taken billions of dollars in losses as they rewrite the value of defaulting assets. Spooked, they have stopped funding mortgages, hurting lenders’ ability to issue new loans and shrinking demand. The Federal Reserve has stepped in, cutting interest rates two consecutive times — once by a half-point in September and by a quarter-point in October— to 4.5% to encourage economic expansion. The Fed said last week it expects the housing slump and credit crisis to slow economic growth and push unemployment up slightly next year. A separate S&P index covering 20 U.S. metropolitan areas showed a home price drop of 4.9% in September from a year earlier. Only five metro areas — Atlanta, Charlotte, Dallas, Portland, Ore., and Seattle — showed an increase in prices, but S&P noted that the pace of their increases is decelerating. Tampa and Miami led the index with the biggest year-over-year declines at 11.1% and 10%, respectively. It also showed drops in San Diego of 9.6%; Detroit, 9.6%; Las Vegas, 9%; Phoenix, 8.8%; and Los Angeles, 7%. The S&P’s 10-area index decreased 5.5% in September from the previous year. On Thursday, the Washington-based Office of Federal Housing Enterprise Oversight is to release its third-quarter index of U.S. home prices. Unlike the S&P index, the government’s calculation of home prices has remained in positive territory. It is calculated based solely on loans of $417,000 or less that are bought or backed by government-sponsored mortgage companies, Fannie Mae and Freddie Mac — excluding many of the riskier loans that have gone bad this year. 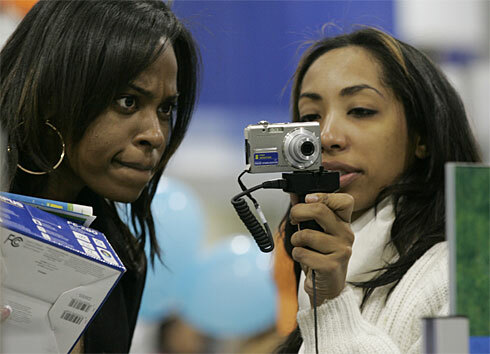 Jessica Boyd, left, and Dorcas Tejeda look over a digital camera at a Best Buy in Atlanta on Friday. You want to buy a computer, digital camera, high-definition TV or other tech gear this holiday season — only the prospect scares you half to death. It’s bad enough that you need an engineering degree to decipher tech terminology: Progressive scan, HDMI and 802.11G, anyone? What really gives you the willies is having to slug it out with the geeky salesperson who is spilling out this jargon. Your mind is racing: Where do I shop? Does the salesperson really have my best interests at heart? Is he or she pushing brand X over Y because the boss is tossing them a bonus? Am I getting a good deal? For that matter, do these guys have a clue what they’re talking about? “I have had talks with sales staff who didn’t know the difference between 1080i and 1080p (which is pretty important if you demand a top-notch picture),” says David Miller, a geographic information systems analyst in Lincoln, Neb. Salespeople prey on naïve shoppers, so research the products on your wish list. Start by querying tech-smart neighbors, co-workers and relatives. Ask if they’re pleased with their own purchases and if they would buy the products again at the same place. If a buddy is particularly knowledgeable, try to entice him to come with you on your shopping spree. “We all have that ultra-geek friend who knows everything about everything but likely lacks in the social graces,” notes Monique Rupley of El Dorado Hills, Calif., who provides support for a telecom company sales staff. These days, of course, savvy consumers almost always tap into the Internet. You’ll find buying advice at CNet.com, ConsumerReports.org and Retrevo.com, among other sites. There are numerous blogs. And though some of what you’ll read is propaganda, you can also pick up a wealth of knowledge at a manufacturer’s own site. As you do research, consider how the product meshes with the rest of your gear at home. Do you need peripherals or connectors? Is it compatible with other components in your system? Though time-consuming — and potentially risky — you can also do research by going from store to store and chatting up staffers. Just don’t let one of them persuade you to buy before you’re ready. The answer depends on several factors. Are you price sensitive? What level of service do you expect before and after the sale? Return policies, tech support and, obviously, the product all weigh in. In a warehouse-type buyers club, for example, you might find the lowest prices; just don’t count on getting much sales assistance. You might have to bring your own truck to cart out a big-ticket item. You’ll generally find reasonable prices and good selection at electronics retailers such as Best Buy or Circuit City. Such stores are often staffed by younger people working for hourly wages, whose expertise may be hit or miss. “The knowledge of the sales staff can vary wildly even within the same store,” Miller says. You’ll often come across superb service in local, family-run specialty retailers. They rarely compete on price, but you’ll get the kind of handholding seldom found elsewhere. Some offer seminars on using a camcorder, say, or HDTV. At Abt Electronics in Glenview, Ill., you get free technical support for as long as you own a product. At Flanner’s Audio & Video in Brookfield, Wis., salespeople have been known to personally deliver gear to a customer’s house. “I am certain I pay more for some things at Stereo Advantage (near Buffalo), but not by much, and I always walk out satisfied,” says Peter Huston, of Buffalo, owner of a company called Starboard Enterprises. Don’t automatically rule out a salesperson just because they’re on commission. Instead of trying to rip you off, the person may well be a career professional interested in building a long-term relationship. That said, it’s perfectly reasonable to ask if a salesperson is earning a higher commission selling you one product instead of another. Many buyers are jilting “bricks-and-mortar” stores for online retailers. Folks spent $22.5 billion or 14.1% of consumer electronics purchases online this past year, according to the Consumer Electronics Association. That’s up from 5% in 2005. Shopping online presents obvious advantages. It’s convenient. You avoid crowds and pushy salespeople. Comparing prices is easy. You often get a sweet deal. But online shopping is fraught with risks, especially if you deal with fly-by-night sites. The rock-bottom price at TrustUsPrettyPlease.com is likely too good to be true. The sale may not include required parts, batteries, cables or warranties. Returns might be a problem. Moreover, online shoppers don’t get to stare at a TV, hear a stereo or test a laptop keyboard. There are obvious red flags when you walk into a store. Run for the hills if a salesperson accosts you with the question: “How much do you want to spend?” before dragging you to some product you don’t want. Same thing if he or she shows you one thing when you’ve asked to see another. Instead, the salesperson should ask about your needs. If you’re in the market for a TV, for example, you should be asked what kinds of shows you and the family watch and what the lighting conditions are in the room where it will be. It’s OK for you to drill the seller. Ask what products they recommend to their own parents or kids. If possible, also seek the advice of non-salespeople in the store, such as those in the service department. Feel free to haggle. Even if the retailer won’t budge on price, they may throw in cables, batteries or accessories. You may also save as much as 30% or more on “open box specials.” These may be floor models, discontinued items or the last one in stock. Examine them for blemishes. If returned, find out why. Make sure you get a full warranty and all the parts. Some PC makers sell discounted “scratch and dent” and refurbished models in online outlets. These have regular warranties. In a painful reminder why real estate is traditionally a long-term investment, the National Association of Realtors said Wednesday that the median price for an existing home slid a record 5.1% last month to $207,800, bringing values back to March 2005 levels, because many buyers are having trouble getting financing. Sales of existing homes dipped 1.2% from September to October to a 4.97 million adjusted annual pace because condo sales tanked 9.1%. Compared to October last year, sales of single-family homes and condos were down almost 21%. “That light at the end of the housing meltdown tunnel appears to be an oncoming train,” Joel Naroff, president of Naroff Economic Advisors, wrote in a research note. There is now almost 11 months of homes on the market, and Adam York, economic analyst at Wachovia, said he expects it will take up to three years to work through that glut. The problem is twofold: Buyers with poor credit and little money for a down payment have very few options to get a loan. At the same time, buyers who need to borrow more than $417,000, a so-called “jumbo” loan, are being squeezed out by higher interest rates. In Southern California, sales financed with mortgages above $417,000 have dropped 60% since the summer, according to DataQuick Information Systems. Steven D’Antoni, 32, was looking to buy a home this summer, and made a $680,000 offer on a four-unit property in the San Gabriel Valley of California in July. By region of the country, sales were unchanged in the Northeast and the South and down 1.7% in the Midwest and 4.4% in the West. New rules about where British Columbians can smoke and how cigarettes may be sold will now come into effect at the end of March to give retailers time to adjust. The regulations announced Tuesday put in place legislation originally passed last March. It bans smoking in all indoor public spaces and workplaces as well as within three metres of doorways or open windows. Vendors will also be prohibited from displaying tobacco products in places accessible by those under 19 and advertisements on countertops, hanging from ceilings or on outdoor signs will no longer be allowed. Currently about 15 per cent of British Columbians smoke, “and we’re going to try to drive that rate down even more,” Abbott said. Some day tobacco could even be banned, he said. In September, new legislation banned tobacco use in schools and on school grounds. Next October, all health authorities will also be required to be smoke-free. The rules were originally expected to come in force early in 2008, but six weeks of consultation in July convinced the government to give retailers and the hospitality interest a small reprieve. Under the provincial regulations, smoking on patios will still be allowed. However, municipalities could choose to impose stricter rules. You are currently browsing the Les Twarog Vancouver Real Estate and Condo Blog blog archives for November, 2007.